If you haven’t registered yet, there’s still time. We hope to see you there! Join us for this unique opportunity to learn about the inner workings and treasured collections of the Washington State Archives – Digital Archives on Wednesday, November 13th, 2013. Located in Cheney on the Eastern Washington University campus, the Digital Archives is the nation’s first archive dedicated specifically to the preservation of electronic records from both state and local agencies which have permanent legal, fiscal or historical value. We’ll learn about their holdings, take a tour, and navigate the Archives’ website. This unique and important Inland Northwest information resource is sure to have relevance to all INCOL libraries and patrons. Contact the INCOL, Continuing Education co-chairs: Paula Swan (509-533-3809) or Janine Odlevak. (509-533-7046). Please post this flyer in your libraries! 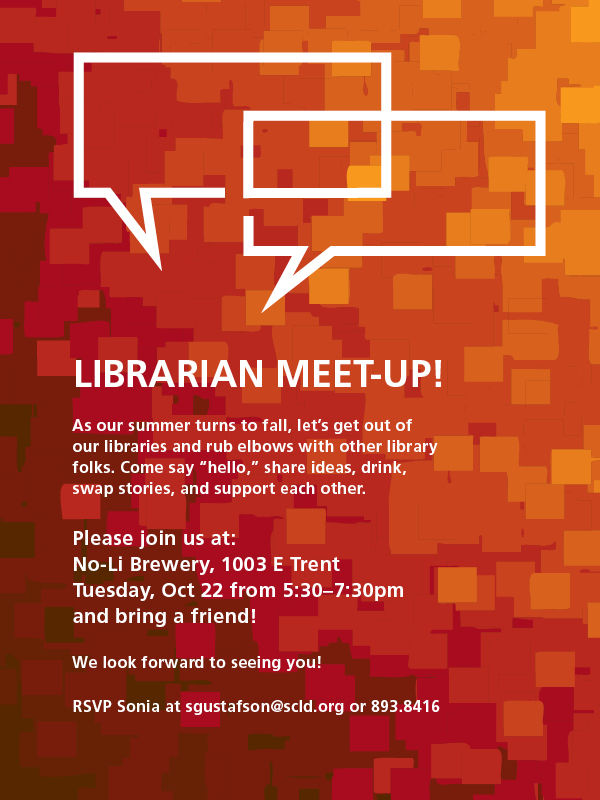 As summer turns to fall, let’s get out of our libraries and rub elbows with other library folks. Come say “hello,” share ideas, drink, swap stories, and support each other. Feel free to post this flyer in your libraries.